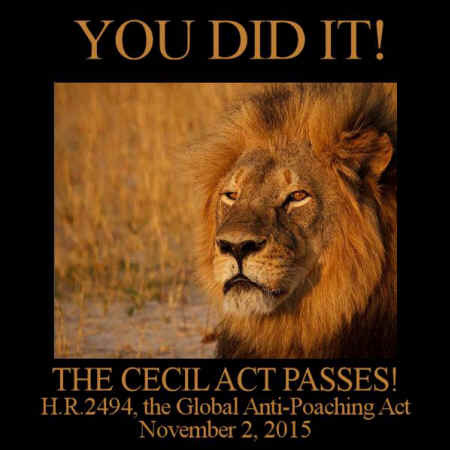 The US House of Representatives just voted to pass H.R.2494, the Global Anti-#Poaching Act. This bipartisan bill provides additional tools and resources to curb illegal killing of some of the world’s most iconic and at-risk species and trafficking in their parts. Poaching is a global crisis, and the world needs U.S. leadership on the issue. Special thanks to House Foreign Affairs Committee Chairman Ed Royce and Ranking Member Eliot Engel for introducing the Act and championing it through to a vote. Building off the momentum from the Enough Project’s event on the Hill last week, this act is a crucial step in the effort to break the links between wildlife trafficking networks and mass atrocities. This is an incredible victory, and one YOU made happen! This is truly Justice For Cecil The Lion!